I usually make black tea (along with the occasional pu’erh, or gen mai cha, or an herbal blend with mint and chamomile), so the Classic Laoshan Black was the first one I tried. They describe it as “very smooth and viscous” with “a distinct dark chocolate bite”, phrases which are descriptive and convey useful meaning while not literally describing anything real. I found the chocolate notes unpleasant, but was surprised the second time I made it, when the flavor seemed less obtrusive; perhaps my palate got used to it? A decent tea, but I liked it more when the distinctive elements were less prominent, so not something I would come back to after the packet was exhausted. The Nirvana blend (“sencha-style green tea, peony petal, berries, and figs”) sounds like the sort of fruity herbal tea that I’ll occasionally drink as a change of pace, but which has never been a favorite. And indeed that was my first impression, although oddly enough not my second. The first cup I made was very fruity, to the point where the green tea was completely overwhelmed. Basically, okay. The other cups were less fruity, and I could taste the green tea, but the whole was less than the sum of the parts: a boldly fruity herbal tea, or an unflavored green tea, would have been preferable to a a combination in which both flavors were present but neither dominated. I’m not sure what made the difference, if my palate adjusted so the fruity flavors were less conspicuous, or if I simply used a bigger spoonful the first time I made it, or if the flavorings were unevenly distributed in the tea and I got a more concentrated dose of the fruity elements the first time. Regardless, if I were to buy another tea like it, I would get an herbal tea only, with no actual tea at all in it. On the whole, the shipment did what I hoped it would do, which is to knock me out of my rut and get me to try different flavors. September’s shipment has a ginger lime rooibos tea, which sounds intriguing despite my usual dislike of spices in herbal tea, plus a black tea, a green tea, and a matcha/maté blend. And then starting in October, I’ll have the option of receiving only unflavored teas, which could be an improvement. I think I’ll probably only stick with it for three or six months, but for now it’s a nice change of pace. A man in a sheepskin waistcoat enthusiastically washed his horse’s feet. A foggy man takes his leg huggly. Everyone on the provost’s estate was fat. Only the provost was thin. But the provost spent most of his time in Buda, near the king. In the first sentence, “a prépost házánál” basically means “near the provost’s house”, and I would have been tempted to use a construction like “in the provost’s household” or “attached to the provost’s house”. But “on the provost’s estate” is accurate enough, and makes the author’s point. And in the last sentence, “jobbára élt” could be translated as “for the most part lived” (or “resided”), but “spent most of his time” is a more natural English turn of phrase, even if it isn’t as precise a rendering of the exact words. I’m concerned that there’s an imbalanced feedback mechanism: if I take too few liberties, people will note the awkwardnesses, whereas if I take too many, people may not even realize I’m losing some of the author’s voice. But not taking feedback is even worse than not getting feedback. It’s clear a bit more treason is in order. I’ve been thinking about reactivating this blog for a while, starting of course with a quick update about how I’ve progressed since the last time I talked about it, and what my plans are, and … and you know what, it would be a lot of work to do even a half-assed summary. So I’m just going to do fragmentary posts for a while, dropping a random detail or two into each one, until I feel like I’ve caught up. I’ve ordered a 30-minute hourglass (turns out the term to search on is “sand timer”) to help me stick to this goal. My old host is going out of business, so I need to transfer my domain to a new host. This is a quick test to make sure that transfer worked. If all has gone well, this post will show up on the new site, but not the old site. If you see this post, then this means that you’re at the new site, and the DNS change has propagated correctly. I was diagnosed with ADD in October. In hindsight, there are a lot of red flags, but until recently I was attributing my cognitive difficulties to chronic fatigue. After I was diagnosed with sleep apnea, though, and started using a CPAP machine, it became obvious that even when I was well-rested there was something significant going on. I brought the subject up at my annual physical in June, and after only four months of putting it off finally picked one of the psychiatrists off the list she gave me and made a phone call. The psychiatrist started me on 10mg of adderall, then bumped it up to 20mg after a couple of weeks. (Basically, the inital dose is usually not enough to help, it’s just to establish that I can tolerate the medicine.) At 20mg, the effects were pretty obvious: I had a big spike to my productivity. The principal effect is that it’s easier to get multi-part tasks done, even when it’s something as simple as writing an e-mail or figuring out a Hungarian sentence. I think there are two separate cognitive effects involved. First, an inhibition against switching tasks; and second, an enhanced ability to divide a single task into multiple steps while maintaining a mental image of how the parts combine to form the whole. Same thing with Hungarian: it’s easier to sit down and read through a whole page instead of getting through a couple of sentences and deciding to quit and do something easier. Plus, on the ADD meds, it takes less effort to read each Hungarian sentence. I feel like I’m automatically adjusting my focus to the correct level: when I need to look up a word, I’m zooming into that one word, while not losing sight of the context, so that when I get the definition it plugs naturally into the sentence, whereas before I took ADD I would look up all the words I didn’t know in a sentence, and then I would look up some of the words again because I’d forgotten them, and then I’d have to work out how the grammar made them fit together, and it was a constant low-level effort of will not to just zoom out and see the whole page and feel overwhelmed. Staying on task isn’t entirely beneficial, by the way. If I turn on the TV while I’m eating dinner, it makes it really easy to keep watching a second or a third or a fourth episode. I’m not taking meds to enhance my ability to bingewatch Netflix, but that is an effect. As for side effects, well, I found myself going to bed later and later each night, which was a big problem. The reduction in appetite was also pretty significant. I went from 142 pounds to about 130 over the course of a month. I adjusted my diet some to compensate, but I felt like I didn’t really get the problem under control until around Christmas, when I started taking a two-day drug holiday each week to let my appetite and sleep cycle reset. Unfortunately, there was another side effect which was more serious. When I went in for my annual rheumatology appointment, the nurse measured my heart rate at 136 bpm. About 20 minutes later they re-measured it and it was a bit over 100, but that was still pretty worrisome, especially since my blood pressure was also up from a year before. I ordered a Fitbit online to monitor my heart rate, and the quick summary: it is way too high. After a week without adderall, I’m averaging 70-80 bpm when I’m sleeping, and 105-115 when I’m awake. By contrast, at my last two physicals my heart rate was 56 and 60. My psychiatrist discussed some non-stimulant ADD drugs with me, and I’m planning to start one of them this weekend. There are a couple of different options, and they both need to be ramped up from a low initial dose, and could take a month or so before they reach an effective dose. And of course if the first drug doesn’t work out, I have to start all over again. So right now my productivity is practically non-existent, and it could two weeks before I’m back up to snuff, or it could be three months, or I could never find a sustainable solution that worked as well as the unfortunately unsustainable one did. Have to say, this last week was below average. I read a 22-page Justice League comic book story, in Hungarian, and compared 1½ other Justice League stories which I’d read the week before to the original English. I did have a couple of medical appointments to deal with, but it’s still less than I should have accomplished. I’m particularly disappointed that I did so little this weekend. Checking my understanding of the Hungarian to the original text shouldn’t have taken too long, but I only got through about half a story. I should do more. I noticed that at one point the translator changed “the last survivor of a noble Martian race” to “egy kihalt, nemes faj utolsó képviselője a mars bolygóról”, (roughly) “the last representative of an extinct, noble race from the planet Mars”. I’m not a good judge of Hungarian style, so maybe the sentence does sound better that way, but it looks to me like the translator decided to change “survivor” to “representative”, then had to make other changes to compensate. Not at all sure that was the best choice. 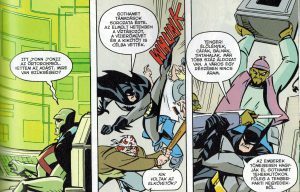 Currently I’m reading a novel called The Invisible Legion by Jenő Rejtő, but I hit a slump the week after Christmas, and decided to shake off the doldrums by reading one of the comics I bought in Hungary years ago, a translation of Justice League Adventures. Since I have both the translation and the original there was the added advantage that I could check my work. J’onn J’onnz here (speaking) from the Watchtower. I received your transmission. What assistance do you require? Gotham has been hit by a series of attacks. In the last few weeks they’ve targeted the water reservoir, the hydroelectric plant and the harbor. Sea creatures. Sharks, whales, squid. There are already over a hundred victims. A section of the city is without power. People are abandoning Gotham in truckloads. Mainly from the quarter by the shore. I read you. This is J’onn in the Watchtower. What do you need, Batman? Gotham’s under an attack of sorts. In the past few weeks the reservoir, hydroelectric plant and harbor have been hit. Badly. Assaulted. By sea life. Sharks, whales, squid. The casualties are in the hundreds. Parts of the city are out of power. People are leaving Gotham by truckloads, especially those in seaside residential areas. What I find most interesting is how the translator obviously didn’t see a good way to translate the incomplete question “When you say hit, you mean …” and substituted a different question, to which Batman’s response would still make sense. Also interesting, how the translator swapped the order of the sentences in the first panel. I seldom dream. If, in spite over everything, I do, then I wake with a start, bathed in sweat. At times like those, I lean back, and wait for my heart to calm, and contemplate the irresistible, magical power of night. As a child or in my youth I never had dreams either so good or so bad, only in the current of old age do kneaded terrors again and again from the silt of the past become solid, which therefore are so frightening, because these are composed more tautly, more tragically, like I could at one time have lived through them, although in truth such things from which I awake screaming never once befell me. I seldom dream. When it does happen I jerk awake, covered in sweat. On those occasions I lean back and wait until my heart is once more calm, and contemplate the irresistible, magical power of night. As a child or in my youth my dreams were never good or bad, only in my old age does the flowing current of time again and again mold horrors from the silt of the past and make them solid, which are so terrifying because the things they are made of are stretched more tightly, made more tragic, than I could have ever endured, since in reality there never once befell me those things from which I awake screaming. I seldom dream. When I do, I wake with a start, bathed in sweat. Then I lie back, waiting for my frantic heart to slow, and reflect on the overwhelming power of night’s spell. As a child and young woman, I had no dreams, either good or bad, but in old age I am confronted repeatedly with horrors from my past, all the more dismaying because compressed and compacted, and more terrible than anything I have lived through. In fact nothing has ever happened to me of the kind that now drags me screaming from my sleep. His version is much better than mine. I can see myself moving in the same direction in some places as I polish, for instance, “When it does happen” is close to “When I do”, but Rix has moved a bit further from the original sentence structure than I have, to the translation’s benefit. I might have ended up with his phrasing if I’d considered it a bit longer. One place where I like my version better is “As a child or in my youth”, which is both closer to the original sentence than “As a child and young woman” and in my opinion sounds better. Unfortunately, in the very next phrase I’ve made an error of meaning, caused by polishing a sloppy English translation without paying close enough attention to the original. I might also make a case for “I jerk awake” instead of “I wake with a start”, but if one sounds better than the other it’s not by much, and I think I erred in changing “bathed in sweat” (which retains the connotation of the Hungarian “fürödve”) to “covered in sweat”. I think “lie back” is better than “lean back”, and “compressed and compacted” better than “stretched more tightly”. The stuff with age’s current and the silt of the past in my version is a clumsy attempt to retain the original’s metaphor, which Rix discards completely in favor of a paraphrase that keeps the meaning. I do think “than anything I have lived through” is further from the original meaning than “than I could have ever endured”, and I’ll give myself a point there.